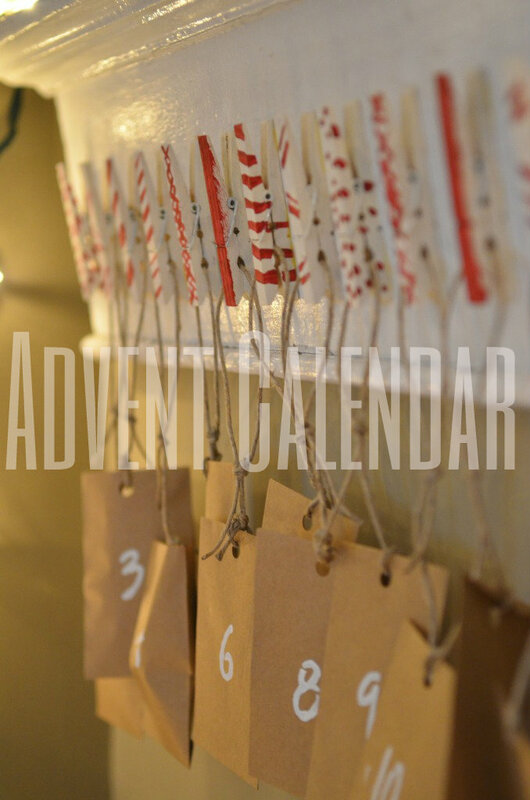 After seeing various inspirations for advent calendars on pinterest, I finally decided on one I wanted to make. Here's what I decided on, and I couldn't be happier with how it turned out! Step One - Find a piece of wood. I happened to find the perfect piece in my basement. It must be one of the original door mouldings, and it was exactly what I had in mind. I cleaned it off, but didn't bother re-painting because I liked the distressed look. 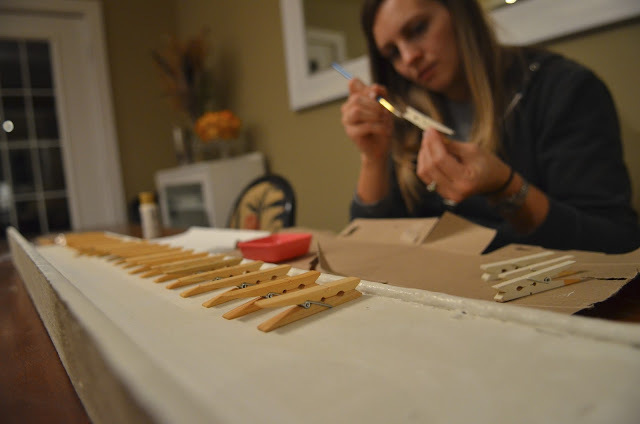 I painted 24 clothespins white, then let them dry overnight. 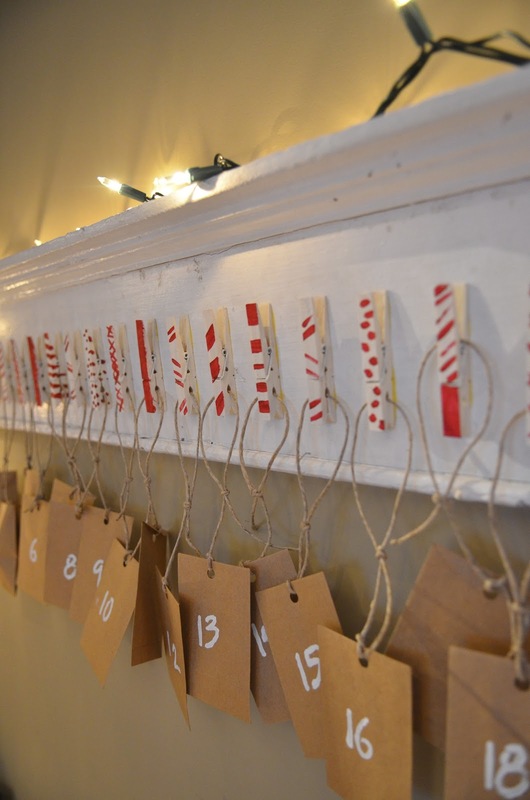 Step Two - I painted the clothespins using red and white paint, trying to achieve a Christmasy look. Let dry overnight. 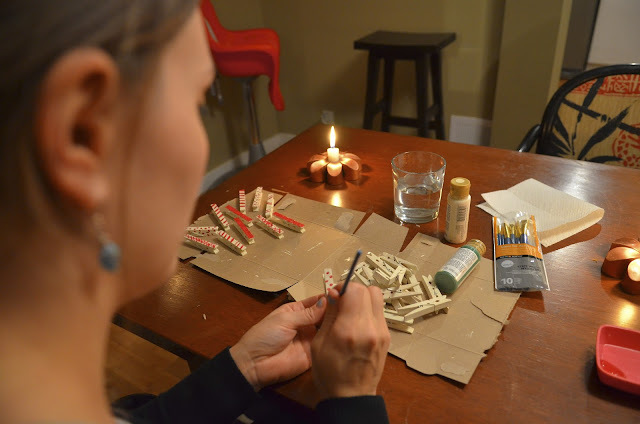 Step Three - Glue the clothespins to the wood using wood glue. I measured the board and divided by 24, so the pins would be evenly spaced. Step Four - Assemble the presents for the Advent Calendar. I originally wanted to use reusable jute bags, but they were a bit over my budget at Michaels, so I just used tiny brown paper bags. I used a stencil to paint on the numbers 1 through 24. Using twine, I tied them in loops to attach to the clothespins. Step Five - Hang it on the wall! Step Six - Watch Soren's face FILL with delight when he came downstairs and saw it on December first. (When these pictures were taken I hadn't quite filled up all the bags with treats. I'll make sure to have them filled in in time for the opening day! So far the treats have included raisins, teddy grahams, and mini ornaments.) Linking up with Jellibean Journals, tatertotsandjello, houseofhepworths, ShabbyNest, and Dare to DIY! Looks so lovely! I love that you made it yourself, it's so much more special that way! You've left me very inspired! How pretty! I saw a clothespin wreath online with little circle day numbers attached, and planned to DIY it too. Unfortunately, I only got as far as printing the activities for the day one the back of the circles, but at least we've got something. Love your pretty tag calendar. I sure wish I'd had time to make one this year. Oh, these look so yummy!! I want some now. :) I hope you are having a wonderful weekend. Thank you so much for sharing at A Bouquet of Talent! So happy to have you share. Ummm... This is genius! And it turned out super cute! Love this idea! I like that you can pack it away and reuse everything next year! This is awesome! 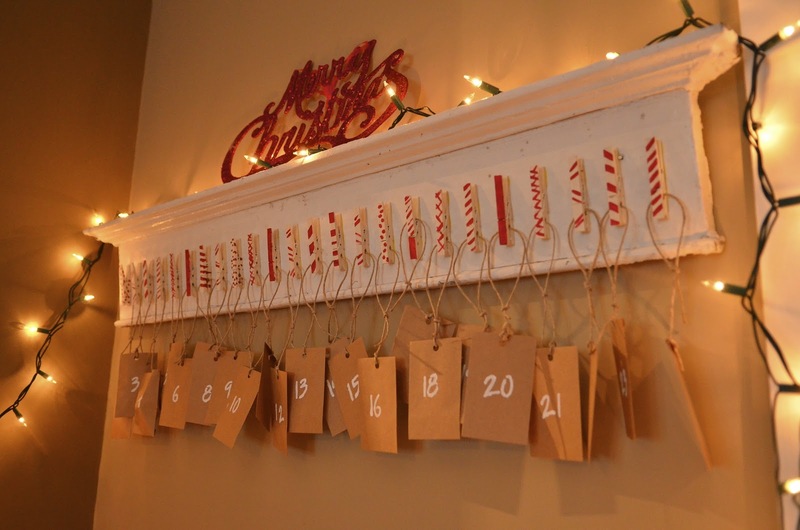 And such a clever take on the advent calendar. This looks terrific! Love it and you can re-use this next year. So awesome! This is seriously one of my favorite advent calendars. Seriously. It's classy yet whimsical. Thanks for joining the Dare to DIY!